In advertising as much as in the news, professionals in any field relating to communication know that a picture really is worth a thousand words. I really don’t think there is any field in which this is truer than in science. Biologists produce amazing images every day that can really speak to how the body works and how we understand disease. We are using increasingly complicated techniques that rely on extremely sophisticated understanding of physics and computer science, pushing the boundaries of what we can see. Microscopy is now a science in its own right, and imaging specialists work with scientists in every field every day to produce incredible pictures of how life really works on the microscopic level. If you are not a scientist but love science, you might be interested in looking at all the different ways we have of looking at microscopic life – and what we can see with them. If you have ever taken a biology lab in high school, you have probably brushed against light microscopy. It is the most basic form of microscopy scientists use on a daily basis and it is perfect to look at whole tissues – whole groups of cells and how they interact. 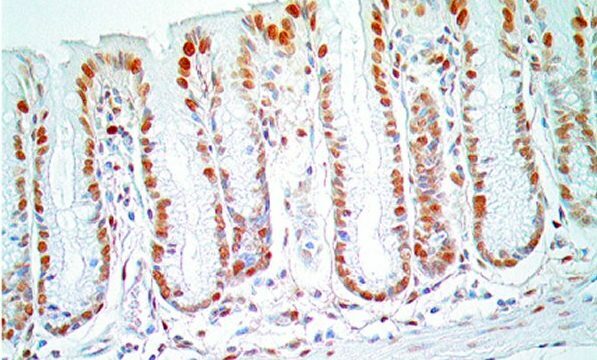 For example, this is a picture taken using light microscopy of the lining of the intestine. The swirls you can see at the top of the picture are called villi and are the main system our body uses to absorb nutrients from our food. Each individual dot in the picture is a single cell – as you can tell, cells are organised differently in the layer that lines the villi as opposed to deeper down into the gut. Fluorescence microscopy is probably the most commonly used imaging technique in cancer biology. It uses lasers to take pictures of fluorescent microscopic objects. 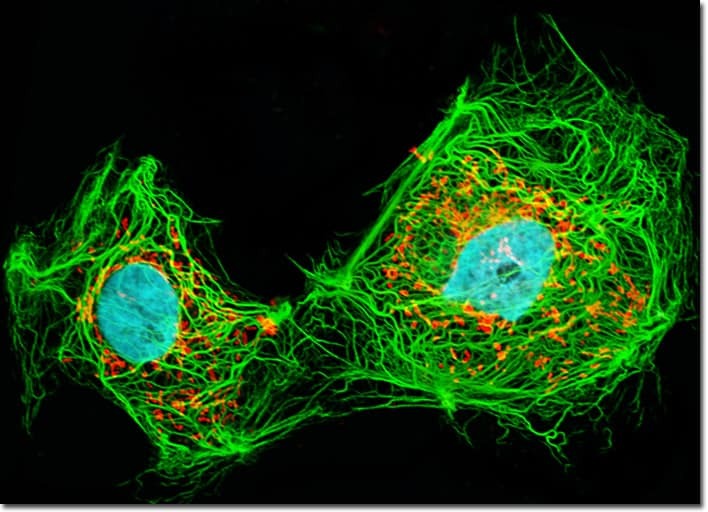 While of course cells and tissues are not usually fluorescent, we can stain cells with fluorescent dyes. 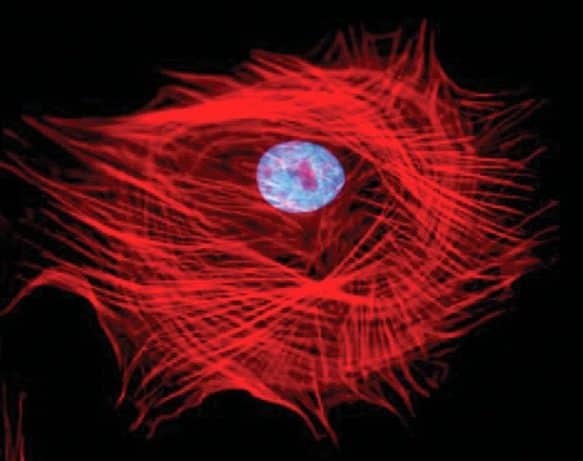 For example, cell biologists who want to look at the internal scaffolding that keeps cells in shape (which is appropriately called the cyto-skeleton, literally the skeleton of the cell), they stain cells with special dyes that bind specifically to the proteins that make up the scaffold. These dyes are also fluorescent, which means that shining a laser on the cell using a fluorescence microscope will result in a beautiful image like this one. Confocal microscopy has in recent years become a key tool scientists use to understand how cells work. It is a type of fluorescence microscopy, but it has much higher resolution. This is really really important when imaging really really small things. 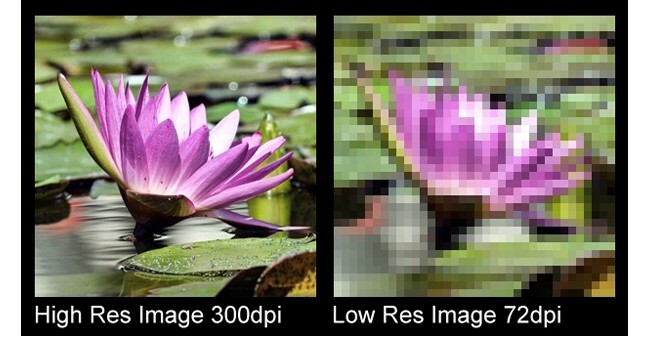 When taking pictures of macroscopic objects (like landscapes, people or waterlilies), we can achieve sharp, highly resolved images as long as we take pictures with equipment that has a sufficient number of pixels. However, when imaging microscopic objects, achieving very sharp images is made very difficult by some bottom-lines rules of physics. In short, cells are not much bigger than the wavelength of the light that we use to see the cells, which means that there is a lower limit to the size of objects that we can look at through a microscope. However, confocal microscopy stretches that limit by looking at cells through a very very small hole (known as pinhole) which cuts out a lot of the unwanted fuzziness. Thanks to confocal microscopy, we can take some amazingly detailed images, like the one below to help us understand how individual cells work and move around. This is a term that is broadly applied to any fluorescence microscopy technique that allows for imaging at a resolution that is lower than the lower limit established by physics. These techniques use a variety of exceptionally clever physical tricks to get around the limit and image not just individual cells, but individual molecules within the cell. This is especially exciting since a lot of biology research revolves around trying to work out how different molecules interact with each other -super resolution microscopy gives us a chance to actually watch them interact in real time. In this picture,you can see the same cellular structure imaged both with confocal microscopy (on the left) and with super-resolution microscopy (on the right).As you can tell, each individual molecule stained with the red and green dies is visible in the right-hand side picture, whereas the intricate details of their interaction are essentially masked by the blurriness on the confocal image. Electron microscopy images are not news and have been captivating the attention of the public for decades. Unlike every other type of imaging we have looked at so far, electron microscopy is not a type of light microscopy in that it does not use light. Instead, it uses a beam of electrons shot at a gold-coated sample to take incredibly detailed images of incredibly small-scale objects. However, in order to be imaged this way samples require an extensive amount of processing, which means that whatever images we acquire depict cells and molecules that are not in real-time. 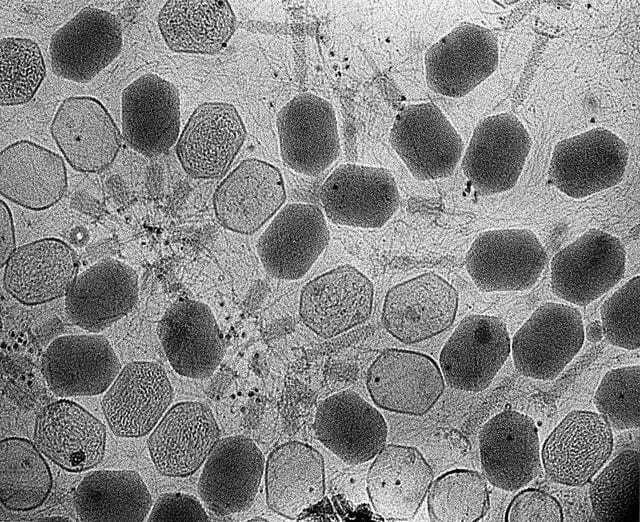 For example, in the image below electron microscopy was used to take pictures of a virus, which is far too small to really look at using any type of light microscopy. Biologists, microscopists and physicists are constantly coming up with new ways to image the microscopic objects that make up the building blocks of life. While a hundred years ago the mere idea of imaging the inner workings of a single cell was laughable, today we are looking for new strategies to take pictures of the molecules within cells as they interact in real time – something that is increasingly becoming a reality for scientists across the globe.